Sheet: 24.3" x 14.2", design: 20.25"x11.2"
Who doesn't love stacked Elephants? We sure do love 'em! We've taken our Cute Fancy Elephant Stencils and stacked 5 of them just for fun! This cute stencil looks great on a door, above the crib or bed or anywhere you'd like to introduce color, pattern and fun to your baby's nursery decor! Fun and easy DIY project, great for beginners. You can also use this stencil to create one-of-a-kind wall art canvas.Perfect choice for Elephant-themed baby nursery! This stencil is so easy to use, virtually anyone can do it. Simply tape it to the wall using BLUE painter's tape, then load your foam roller with a paint of your choice (latex or acrylic). Offload the excess paint on a folded paper towel. Then, just roll over the stencil applying light to medium pressure for an instant fabulous result! Don't press on the roller too hard, otherwise you might get some paint seeping under the stencil. For multi-color effects we suggest using stencil brushes. Since it's a reusable stencil and not a wall decal, you can use it many times and the stencil will last for a very long time. 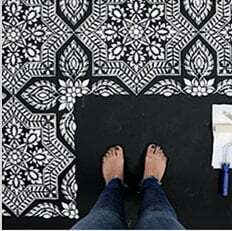 Stencils are perfect choice for those who don't like to apply tacky vinyl stickers to your walls. Stencils offer unlimited color choices to perfectly match your nursery bedding. If you want to make sure that your stencil is properly leveled, try out our Clip-on Stencil Level, (sold separately) and discover how easy it is to achieve perfectly level results without dealing with all those bulky heavy bubble levels and annoying laser levels. The stencil is made out of durable 12 mil clear plastic stencil material. This material is strong but flexible, reusable and easy to clean. We love it so much more than standard 5-8 mil Mylar! It's not brittle, user friendly and just so easy to work with. In our many years of professional stenciling this material has proven to be far superior than any other stencil material we used. Our customers love it too, and we are sure that you'll notice the difference! With proper care and storage our stencils will last a long time and are a pleasure to use.